I have a 40 ft Gatormade flatbed gooseneck trailer for sale. Trailer is air ride and is loaded. Has hydraulic disc brakes for dependable smooth braking and jacks are hydraulic too. 16 ply Hercules tires with spare. Any questions or photos call me. We are close to Sand Antonio, Houston, Austin, and Corpus Christi. 24 hour service! Ready for South Texas runs! We have ramps, chains, straps, and winch! Will work with Dispatchers, privately, licensed and insured. We are a hauling company that specializes in hot shot hauling, using a 3500 series truck and a trailer. We are located in Sorrento, Florida and can pick up and deliver anywhere within the continental United States (excluding Alaska). This is a new express service that will get your cargo to its designation safe, fast and in time! Our goal as a new company is to satisfy our customers needs! Don't hesitate to call on TYLand Express where the price is right along with quality and safe shipments! Thanks for your time and look forward to gaining your business! We have a 2017 Dodge Ram 3500 , pulling a 35+5 with monster ramps and dual 15,000 lb axles. Carrying capacity is 18,000 lbs. We also have a 8000# winch mounted on front of trailer. If you have it we can haul it! We are a hot shot transport company using a ford f350 dually and 40' removable goose neck trailer. Can run in all of U.S.
Driving and delivering products across USA for over 30 years. We take pride in on time deliveries with our 40' gooseneck were "KEEPING AMERICA BEAUTIFUL"
Ten years experience workng in LTL freight. Direct phone contact with driver anytime. We provide expedited services to the lower 48. 25ft flatbed gooseneck with 10,000lb carry capacity, and fold flat ramps. Dispatching o/o hotshots big trucks small company's, big company's . Owned/operated based out of west Texas. We have 30 years in the transportation industry. Running new trucks and fully equipped 40ft gooseneck trailers with ramps, tarps, chains and straps, to carry your loads safely and on time. We are insured and have our authority. Please call for all your transportation needs. We are a hotshot company located in New York. We have hotshot PickUp Trucks w/tarps. Owned/Operated based out of Albany, OR. 2017 GMC 3500HD with 32' Gooseneck car hauler up to 12,000lbs. Also transport general freight in 48 states, 30+ years experience in the trucking business. We strive to be the best in the business with excellent customer service. Please call us today for a free transport quote. 30+ years of safe driving The USA . We have a 40 ft flatbed weight limit of 18,000 or less. We have 3500 dually with 30'flatbed with 6'dove tail gooseneck, haul up to 17000 lbs.all over on time. Can carry anything up to 10,000 pounds, up to 32 ft. In length. 24 hr. Service, you call we haul. We being in trucking for over 25yrs but now doing it with the dullys and looking for hot shot loads weighing no more then 7,000 lbs. 350 Ford and goose neck Big Tex 40ft flatbed trailer. Transportation you can trust! LS Transport is a hot shot company that understands the value of your goods and that time is important . We are capable of fast responses without compromising quality. This is reflected by the care that is given through owr 5 star customer service. HotShot Owned and Operated in Harris County, Texas. Dodge Ram 3500 with 30 ft gooseneck with 5 ft dovetail. We are a hotshot/trucking company located in Houston/spring area. We have hotshot pick-up Trucks w/tarps and 18 wheeler Trucks w/48 ft flatbeds. Here at Diamond State we strive for perfection. With divsions in LTL, FTL, Reefer, Flatbed, Rail, Air and Ocean. We are a true one stop shipping experience. We are an asset based brokerage with an extensive partner carrier network and over 250 years of experience. For many customers we have been able to streamline and lower cost on their entire transportation operation. I'd like to extend an invitation for anyone to reach out to us at any time for anything. We are a hotshot dispatch company. We will find the loads, handle the paperwork, set you up with the brokerage companies, and do the invoicing. Gross 4,000 to 7,000 a week. Need diesel dually and at least 40 ft. trailer with ramps. Call anytime. A family owned business in Birmingham, AL. We are licensed & insured for ltl's and expedited "hot shot" deliveries, while operating under our own dot/mc #'s. We securely haul up to 16,000 lbs safely with our 2012 Dodge Ram 3500 Cummins, 11'4 ft long flatbed truck. We strive to build long-term relationships with our customers by delivering "just in time", every time! Good people providing good business= success! Texas owned and operated. Texas based hotshot company. Our goal is to provide excellent service to our clients with a smooth and easy haul. I am a hot shot dispatcher, I was an owner operator for fourteen years and in March of this year I went to full time dispatching. I dispatch in all 48 states. We handle dispatching, Ifta Filing, Scac Code Filing, billing and we offer fuel cards. If you want to maximize your profits partner with us. 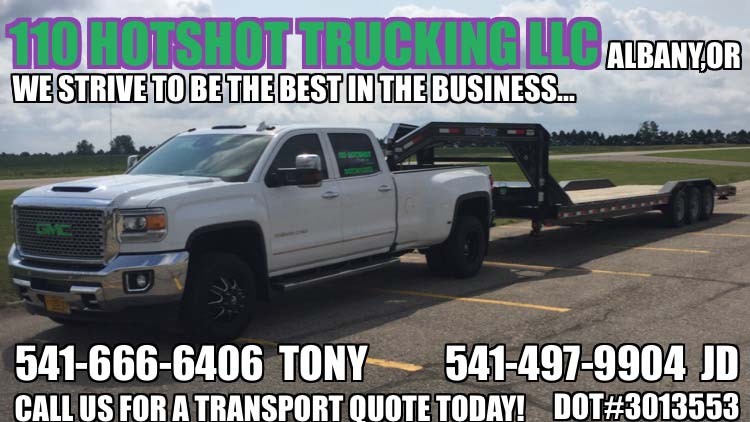 Christian family owned and operated Hotshot company with TWIC card, ramps, chains and straps. Out specialty is in the areas of "Lumber, Nursery material, Grain sacks and Hay. We operate a Dodge Ram 3500 with gooseneck flatbed max hauling capacity of 18,000 lbs. We are available upon date and availability. We care about your product as if it were our own. On time deliveries is what we take pride in. I'm always looking for more local brokers, direct shippers etc. Great rates, fast, efficient, trustworthy and reliable. "If it'll fit on our trailers, we'll haul'it!" Great RATES with quality work and Christian caring attitude. Family owned trucking company is looking to add a CDL driver out of the West TN, East AR, North MS or North AL area. We need a RELIABLE driver. Must have experience and references. Must be able to pass a drug test. Contact me at the contact number listed. Here at Diamond State we strive for perfection. With divions in LTL, FTL, Reefer, Flatbed, Rail, Air and Ocean. We guarantee our work and stand by the service we provide. FPOLogistics is a 4PL Logistics company that specializes in providing Logistic Support, Supply Chain Solutions, Transportation, and Business Consulting. FPOLogistics is a one stop shop for all your business needs. FPOLogistics is owned and operated by military logistics professionals that delivers the results your company requires. When you choose FPOLogistics you are not just choosing a company, but selecting professionals that will work for you. FPOLogistics is dedicated to our mission statement, and we will deliver excellence every step of the way. We look forward to doing business with you in the near future! 3 dually trucks, 2 Ram 3500 and 1 Ford 450, 2- 45' flatbed trailers, 26,000lb dump trailer available soon. Currently looking for local contracts within Utah. Licensed for GVW 50,000 lbs and insured with cargo insurance. Owned and operated. We haul just about everything that can be loaded on a flatbed. IMPEC auto hauling based out of Mitchellville, MD. We are dedicated to providing safe, experienced, reliable, on time HotShot services for all auto's and we are eager to begin the enrollment process with your business. We currently operate a 2003 Chevrolet Silverado 3500 w/ a 50ft. Three car carrier Trailer Ready To Roll. Hotshot carrier driving goose neck flatbed trailer carrying up to 18000 lbs. with length of 39 ft.